Endnotes are available in the PDF version of this Fact Sheet. As the 115th Congress convenes this month, the US economy is in its seventh year of recovery from the Great Recession. Yet many communities in California have not shared in the nation’s recent economic gains. Statewide, nearly 6 million people, including almost 2 million children, are living in families with incomes below the US Census Bureau’s official poverty line, which is about $19,000 in annual income for a family of three. 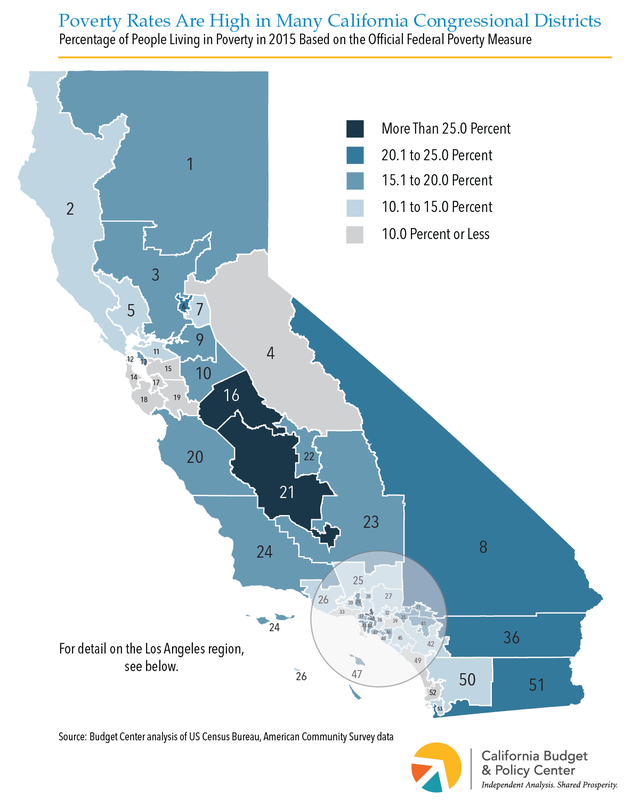 Poverty affects communities in every one of California’s 53 congressional districts, but there are stark differences in the level of economic hardship across districts. The latest Census figures show that the official 2015 poverty rate ranged from a low of 6.8% in District 17 (D-Khanna) in the San Jose area to a high of 30.8% in District 16 (D-Costa) in the San Joaquin Valley. Also, poverty has increased in nearly every district since 2000, and the largest increases are concentrated in inland, suburban communities, reflecting a broader national trend. These findings highlight the urgent need for the new Congress to prioritize policies that give all people the opportunity to thrive and move up the economic ladder. Three congressional districts are extremely distressed, with more than one-quarter of all residents living in poverty. These districts — 16 (D-Costa), 21 (R-Valadao), and 34 (D-Becerra) — include communities in the San Joaquin Valley and in Los Angeles. In eight districts, between one-fifth and one-quarter of all residents live in poverty. These districts — 6 (D-Matsui), 8 (R-Cook), 29 (D-Cárdenas), 36 (D-Ruiz), 40 (D-Roybal-Allard), 43 (D-Waters), 44 (D-Barragán), and 51 (D-Vargas) — include communities along the US-Mexico border as well as in Los Angeles, the Inland Empire, the San Fernando Valley, and the Sacramento region. Only 10 districts have fewer than 1 in 10 residents living in poverty. 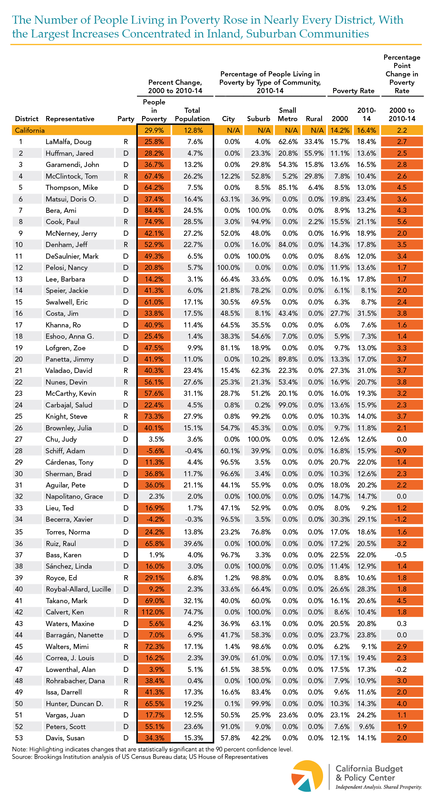 These districts — 4 (R-McClintock), 14 (D-Speier), 15 (D-Swalwell), 17 (D-Khanna), 18 (D-Eshoo), 19 (D-Lofgren), 33 (D-Lieu), 39 (R-Royce), 49 (R-Issa), 52 (D-Peters) — largely include communities in the Bay Area and along the southern California coast. 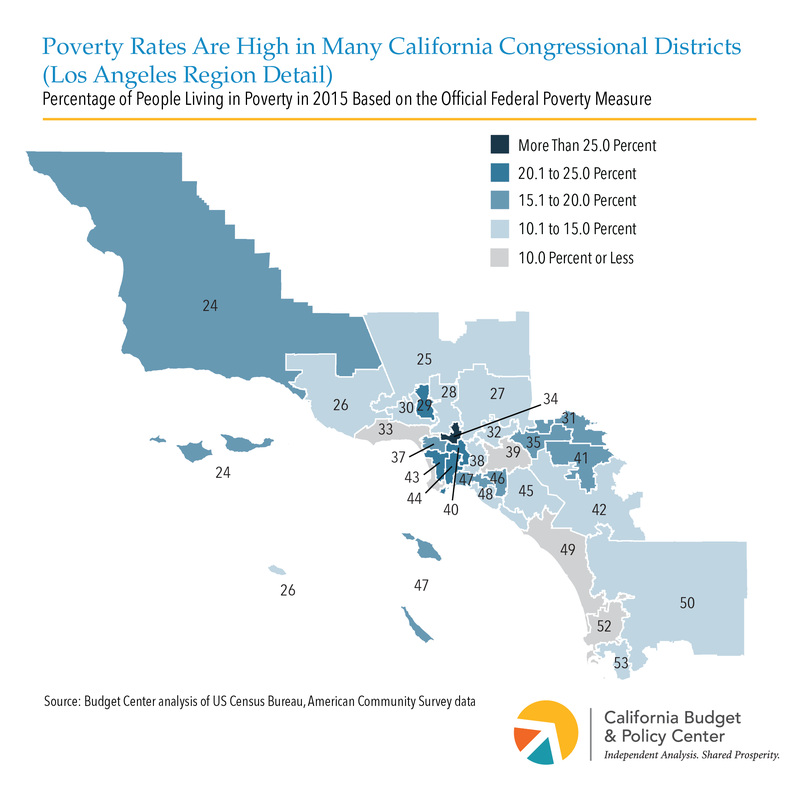 Poverty rates rose in 45 of California’s 53 congressional districts between 2000 and 2010-14. For example, the poverty rate increased by more than 4.0 percentage points between 2000 and 2010-14 in four districts: 5 (D-Thompson), 7 (D-Bera), 8 (R-Cook), and 41 (D-Takano), which include communities in the Inland Empire, the eastern Sierra, the Bay Area, and the Sacramento vicinity. In contrast, poverty rates declined in just two districts, while there was no statistically significant change in the remaining six districts. Between 2000 and 2010-14, the number of people facing severe economic hardship more than doubled, rising by 112%, in District 42 (R-Calvert), which includes suburban communities in Riverside County. Although District 42 experienced the greatest population gains in California during this period (the number of district residents rose by about three-quarters), the increase in the number of residents living in poverty still far exceeded the growth in the overall population. In District 7 (D-Bera), which includes suburban communities east and south of Sacramento, the number of residents facing severe economic hardship increased by about 84% between 2000 and 2010-14, far outpacing the 25% increase in the district’s total population. Three other districts saw the number of economically distressed residents rise by more than 70% between 2000 and 2010-14, far exceeding overall population growth. These districts — 8 (R-Cook), 25 (R-Knight), and 45 (R-Walters) — include communities in the Inland Empire and Death Valley region, northern Los Angeles County, and Orange County. The vast majority of people living in poverty in these districts reside in suburban areas.